1. Spread layer of chips on oven proof platter. Mix cheese dip and chicken together, and spoon evenly over chips. Bake in a 450 degree F oven for 3-5 minutes, until hot. 2. Mix tomatoes and salsa together. Pour salsa mixture over chips and sprinkle with onions. Serve immediately. 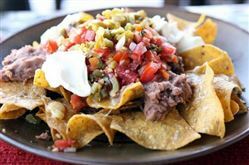 Enjoy this chicken picante Nacho Mexican recipe!